There are many places you can see samples of tile and flooring, but very few where you have the opportunity to consult—at no charge, and no obligation—with a selection specialist trained in all aspects of flooring and tile. 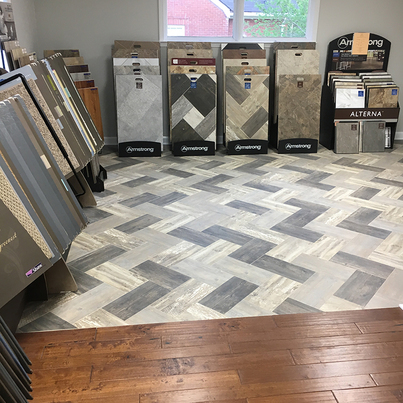 The Marion Tile showroom features one of the Triad's most extensive collections of flooring and tile—all of which are first quality and direct from the manufacturer—on display. Fuel your creative juices with a visit to our showroom! Our selection specialist will be happy to assist you with options for achieving your vision. Don't have a vision yet? Even better. Our showroom is the perfect place to start; you'll find plenty of inspiration, and help is on hand! While enjoying the process of evaluating your options in the showroom, rest assured you are making the best choice, as we only sell first quality materials. While this may seem obvious, it is not the case at most of our competitors, who regularly sell factory seconds, short runs and discontinued products. We are proud of our showroom and the quality products we sell. We are eager to share it with you so come out and see us!